Will ship in one of 3 random colors. Grey, Black, and Coco. Color requests cannot be guaranteed. Our socks are a blend of excellent quality alpaca (50%), nylon and acrylic to offer the best of warmth, durability, wash-ability and comfort. Why not more alpaca? Frankly, our tests show that alpaca is so powerful that only about 30% is needed for the warmth and softness we seek. 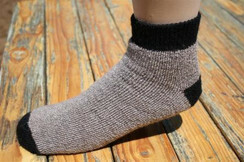 More than 50% alpaca will tend to make the socks not only significantly more expensive, it makes them a little less wear resistant. Years of testing have resulted in the Choice Alpaca blend that feels great, machine washes and lasts over time. Machine washable and dryable. Designed to last!